Cupcake Maker Salon is a great, free application. Feel like a professional confectioner. In the application you will find many options. Select all the ingredients you need and create unique cupcakes. Decorating cupcakes will make you so much fun. Choose from many colorful creams, toppings and sweets. Let’s free your imagination ! – over 300 different items to decorate ! – put the muffins in the oven, make sure they do not burn! – finally decorate the cupcakes as you like! You can share your cupcakes with your Facebook friends or set as your phone wallpaper. In case of any problems with the effect of Cupcake maker salon, instead of giving us the negative opinion, please send us an e-mail and review briefly the problem. It will help us to solve it in the next updates of application. 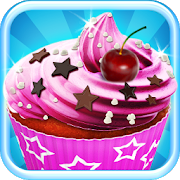 Cupcake Maker Salon is free but contains ads inside the application. Revenue from advertising will help us to create new attractive games and applications. All permissions are required only for advertising and are supported by trusted vendors.